The tolerance zone is a pre-defined horizontal distance extending from the outer edge of a line or pipe that runs underground. The exact distance that define this tolerance zone is 18″ on either side of the line or pipe (utility) plus the diameter of the line or pipe itself. The tolerance zone acts as a warning to an excavator that they need to proceed with caution while working in this area. 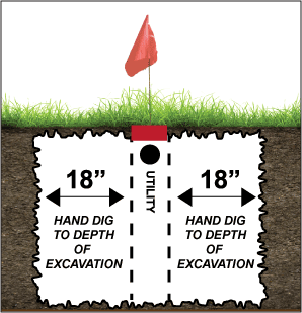 Excavators should hand dig, pot hole or vacuum excavate within the tolerance zone.